$55.00 In stock. Order in the next 18 hours, 7 minutes and it will go out today! As you drop them into the plastic cookie jar the kids will hear it fill up, KERPLUNK, KERPLUNK, KERPLUNK! The sound plus the visual appearance of the cookies makes for one tasty trick! 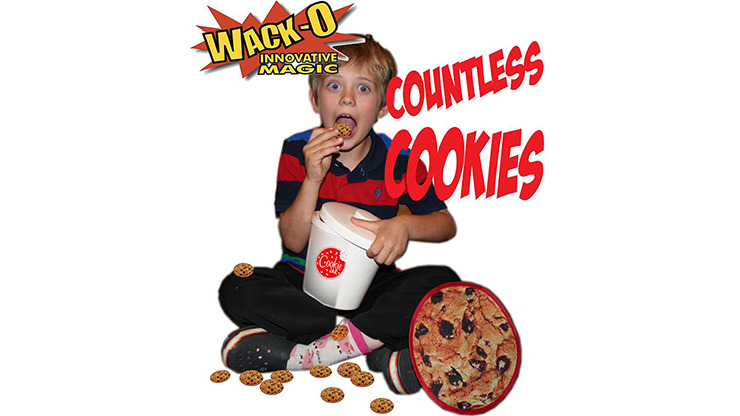 Watch the video as AmazeKids' Danny Orleans shows you just some of the possibilities including a way to produce a giant 10-inch cookie that’s too big to fit in the cookie jar. How do you top that? He performs a barehanded vanish of the giant cookie which you'll easily be able to do -- and will make your kid audiences really scream -- especially when they discover it hanging on your back! For the big finish, Danny has created a way to make the silver-dollar sized cookies turn into a real bag of cookies that you can actually give to the birthday party host to hand out to the children. When you order from AmazeKids, we’ll also send you a free pdf file explaining how Danny takes the presentation beyond the manufacturer's instructions. It explains how he gets the giant cookie on his back and makes the real cookie bag appear. If you can do the Miser’s Dream, you’ll love performing Countless Cookies. Order it now and you’ll be adding one very sweet routine to your repertoire.